MediaMonkey is the music and movie manager for serious collectors. It catalogs audio (CDs, M4A, OGG, WMA, FLAC, MP3, etc.) and videos (AVI, MP4, WMV, etc. ), managing multiple collections for contemporary and classical music, audiobooks, home movies, tv, videos, etc. It looks up and tags Album Art and data via Freedb and the web, offers a file renamer to rename and organize them, and a playlist manager to arrange your music mixes. 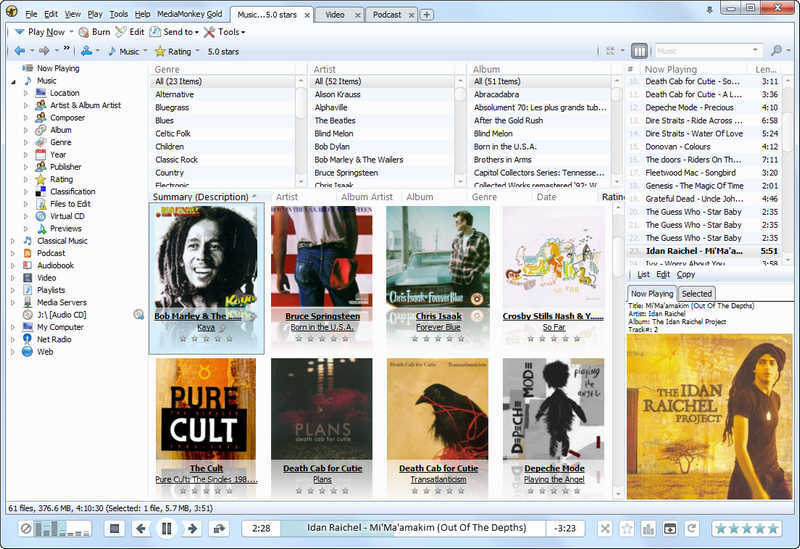 It includes a CD ripper, podcast manager, and downloader to build your library, along with a CD/DVD Burner, UPnP / DLNA server, and sync manager to share it. With built-in conversion functionality, it supports hundreds of devices including iPhones, iPods, Android devices, as well as a variety of televisions and DVD players (via DLNA). Its player automatically adjusts volume levels and supports a Party mode that locks the UI for use at public events. Most importantly, it supports hundreds of scripts, plug-ins and visualizations to further extend its functionality. V4.1.14 is a significant update with close to 30 changes including support for iOS 10, numerous DLNA and sync improvements, several tagging fixes, and more. music manager,movie manager,media manager,manage mp3,media player,manage playlist,cd ripper,cd recorder,mp3 encoder,mp3 converter,ogg,wma,m4a,upnp,dlna,sync An easy-to-use media manager for serious collectors. It rips CDs and downloads files to your library, tags and organizes audio/video files and playlists, syncs with iPhones, iPods, Android, and other devices, and shares with your TV via UPnP/DLNA.